(Melba X Haralson) It originated at the Morden Research Station, Agriculture Canada, bred by C. R. Ure, selected in 1949, tested as M364, and introduced in 1961. The tree is moderately vigorous, rounded to somewhat pyramidal, with wide-angled branching and strong framework. It is hardy to zone 3 but only if well protected, highly productive annually and resistant to fire blight. The fruit is medium to large, 6.5-7.5 cm (2.5-3") in diameter, round to round-conic, and matures in mid-late season in late September. The skin is medium thick, creamy green base, with 50-100% bright medium to dark red overlay. The flesh is white, crisp, very firm, medium texture, juicy, mildly subacid with a spright pleasant aromatic flavour. It is very good for fresh eating and cooking, baking, sauce or pie, and stores well for at least 15 weeks, well past January. Note: In Saskatchewan this cultivar is not fully hardy even in Zone 3, and is best grown topworked on a hardy stembuilder, such as Garnet, Bedford or Nertchinsk. In our orchard Garland has not shown any dieback of branch tips, but some buds died after last winter suggesting zone 3 may be as cold as this variety can go. This variety has also shown a propensity to be killed by weed whackers. 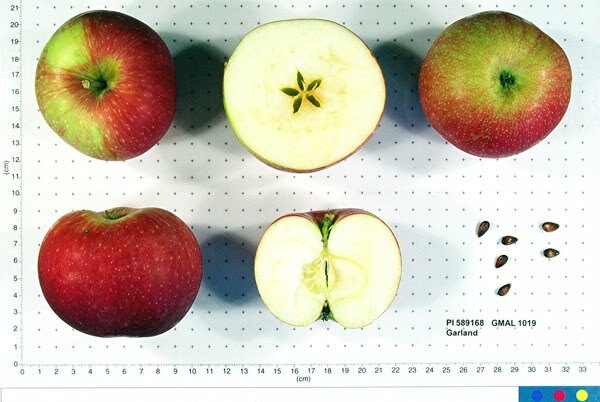 From the USDA Germplasm website: Fruit: size medium to large, 70-85 mm; skin 70-90% red, striped; shape round-oblate; flesh soft, cream-colored, water core; flavor sub-acid, bland; eating quality fair to good; harvest season mid-September, 4 wks before Delicious. Tree: productive; biennial. Early mid-season, red.